Dr. Nilova graduated from the St. Petersburg State Pediatric Medical Academy in St. Petersburg, Russia. After relocating to the United States she passed the American Board of Pediatrics and is a Fellow of the American Academy of Pediatrics. Her residency and training were both in St. Petersburg (with a fellowship in pediatric infectious diseases) and Mt. Sinai School of Medicine, St. Joseph’s Regional Medical Center, Paterson, New Jersey. She is fluent in both English and Russian and is a US Citizen. 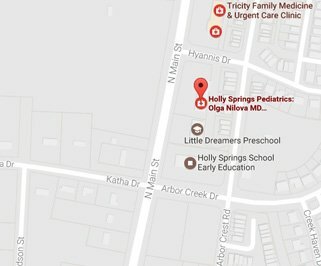 Dr. Nilova resides in Cary with her husband, Chris and their three children, Jenny, Alexis and Jaxon. Stacey Marie Talarico originally hails from upstate New York. She is a graduate of SUNY Brockport with a Bachelor’s in Nursing. Stacey moved to North Carolina in 2007 to work as an RN on the Pediatric Blood and Marrow Transplant unit at Duke Hospital and to pursue her Master’s degree at Duke University. She graduated as a Pediatric Nurse Practitioner in 2010 and is a member of the National Association of Pediatric Nurse Practitioners as well as having been inducted into the Sigma Theta Tau Honor Society. Stacey lives in Cary with her husband, Len, their two children, Estelle and Hazel. and their dog, Baxter. In her spare time she enjoys reading, dinning out, spending time with family and Zumba.